Last week, the Monster Energy NASCAR Cup Series race at the Charlotte Roval featured fireworks. In the closing laps of the race, Jimmie Johnson and Martin Truex Jr were in a battle for the win. Johnson looked to the outside of Truex heading into the final chicane. He was late on the brakes. When he pressed the pedal, the rear end stepped out. He wheel hopped through the entry. Johnson spun across the entry of the chicane. He rolled the #48 backwards to the exit of the chicane. Truex was there, he was nearly down with the chicane and on his way to the win. 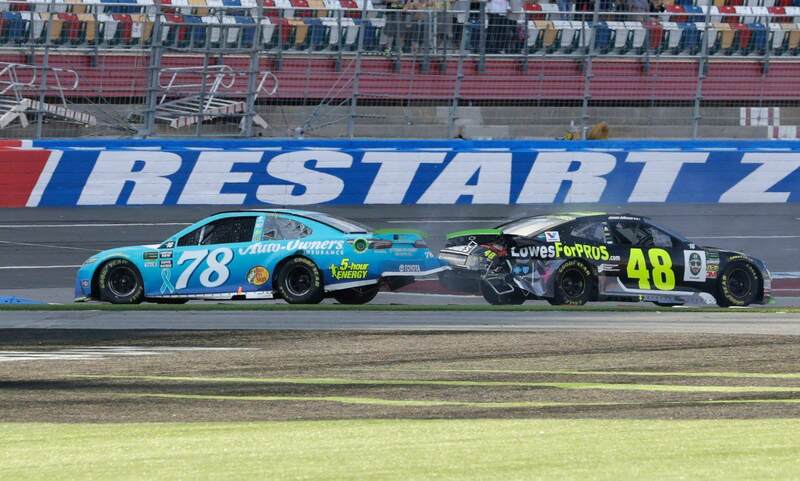 Instead, Johnson clipped Truex on his way off the final corner. Both leaders went spinning just a few hundred feet short of the finish line. As they struggled to get the cars rolling straight again, Ryan Blaney snuck in there and stole the win! After the race, Truex located Johnson in turn one. He put the bumper to him and spun him around. Truex would advance to the Round of 12 regardless. “That’s what he gets,” Truex said after the race of Johnson. 7-time champion Jimmie Johnson’s playoff hopes came to an end. This weekend, NASCAR is back at it again. Dover International Speedway hosts the opening race in the Round of 12 of the NASCAR Playoffs. Apparently, Cole Pearn and the FRR crew suggested a plan for moving on from the Roval. Their plan included an idea that avid cyclist, Jimmie Johnson could buy the team road bikes to make up for it the incident at the North Carolina road course the previous week. Specifically, Pearn was referring to mountain bikes. Johnson took his advice, kinda. On Saturday night, Johnson sent his hauler driver to the store and loaded Johnson’s Chevy Tahoe full of bikes, from the floor the roof. Last night, Johnson grabbed a ladder and gifted the bikes that he just purchased. He climbed on top of the #78 hauler. 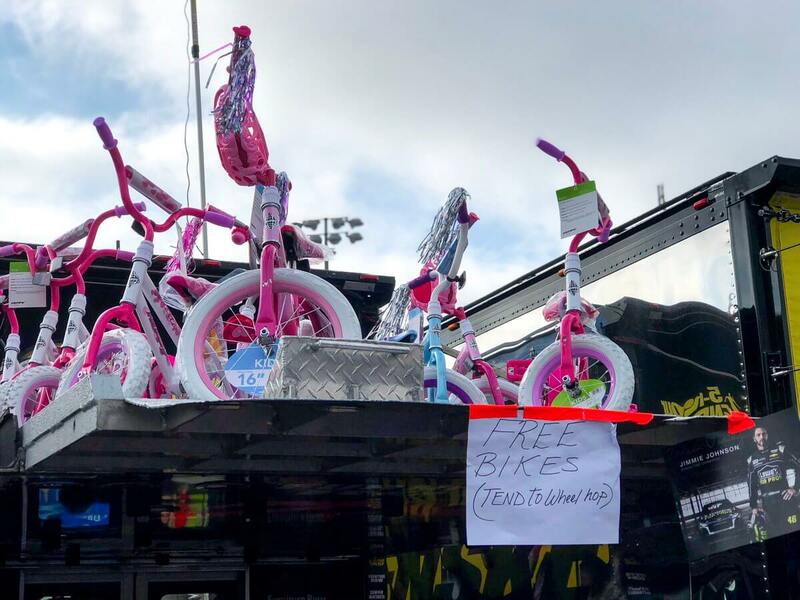 Johnson then dropped at least twelve tiny pink bikes on the tongue of the Furniture Row Racing trailer late Saturday night or in the early morning hours of Sunday. “Well, Cole Pearn suggested I could buy some road bikes to ease the team’s pain from last weekend. After some careful thought and consideration, I went shopping,” Johnson’s tweet read. Jimmie Johnson got special permission from NASCAR before he pulled the prank. The garage area was closed off when Johnson loaded the bikes onto the hauler. That permission came from Buster Auton who is the Director of Transportation for NASCAR. Today, Jimmie Johnson and Martin Truex Jr will take the green. The Gander Outdoors 400 will begin this afternoon. Due to rain, the starting lineup has been set according to points. Truex will start from the third position. Johnson will start the MENCS race from 13th. There’s a small update to this story. The bikes went in a hurry. They have all been passed out to kids in the garage area. Cole Pearn and Martin Truex Jr signed the first bike that was given away. “It was an avalanche of little boys and girls coming up. We delivered them all. They are in good hands,” Chuck Lemay explained. “What a sport! All Kyle did was buy us Ice Cream,” Lemay concluded.